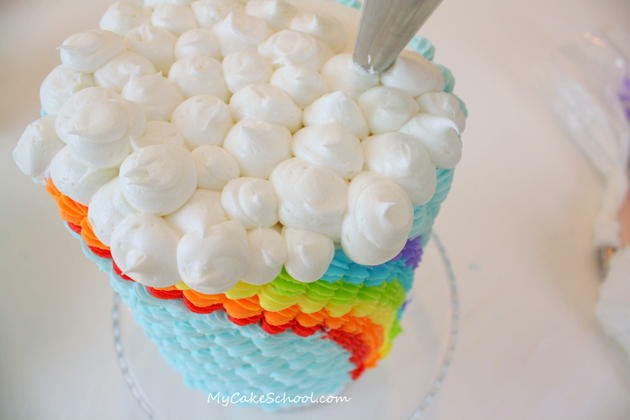 Today I’m sharing a fun St. Patrick’s Day Buttercream Rainbow Cake Tutorial! Of course, this sweet design would work any time of year. Who doesn’t love a rainbow? 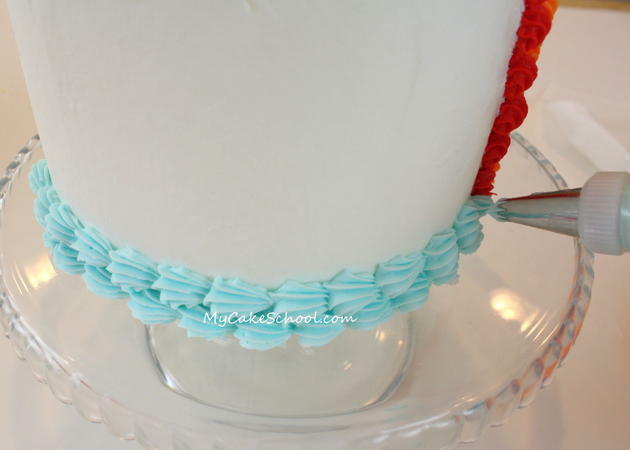 If you are familiar with using simple star piping tips, one of the most basic techniques (after the star border) is the shell border. Today’s design incorporates the shell border times 100! Mainly what I wanted to show you is that you can take a relatively simple technique that you can do well (whether it’s piping dots, stars with the star tip, ruffles, petals, etc.) and cover an entire cake with it. Why reserve the shell border just for the border? It’s time to make a rainbow! 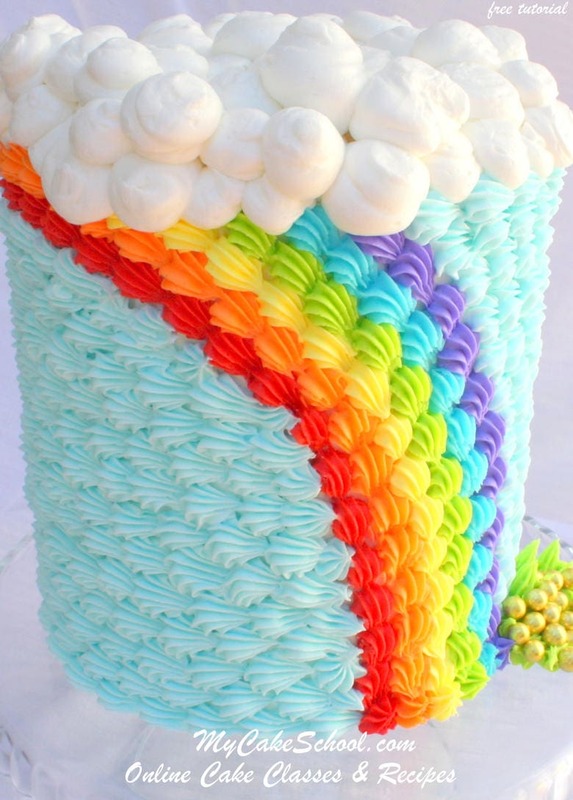 The cake that I’m using today is a tall 6″ tier. I’ve been doing a lot of these lately. Mine is two cake layers, then a small cake board in the center (doweled beneath) with another two layers stacked on top and frosted as one. 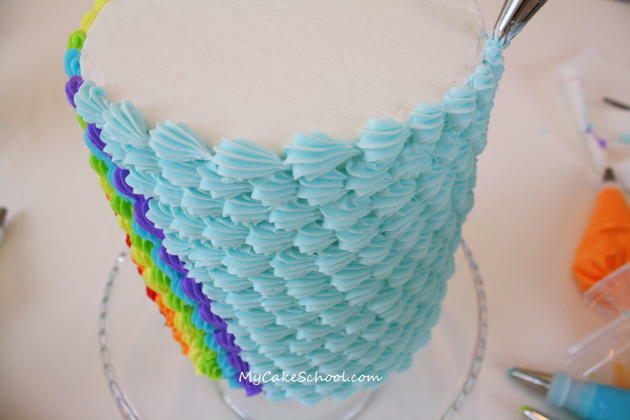 I frosted my cake with a thin layer of frosting…we will pipe over this in a few minutes. You can see that I used a paintbrush handle to map out where my rainbow would fall. 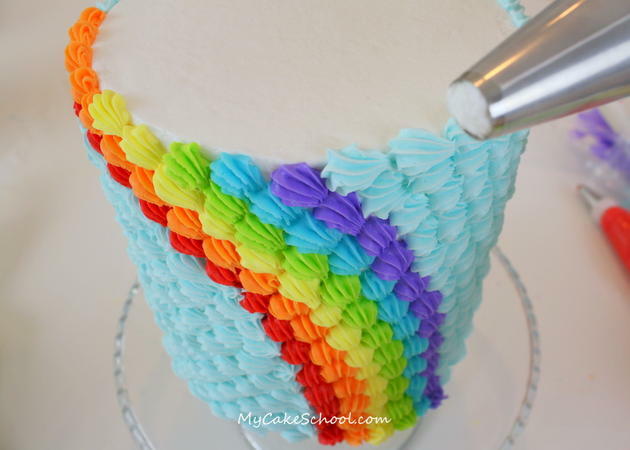 The most time consuming part of this or any rainbow cake is tinting the frosting! 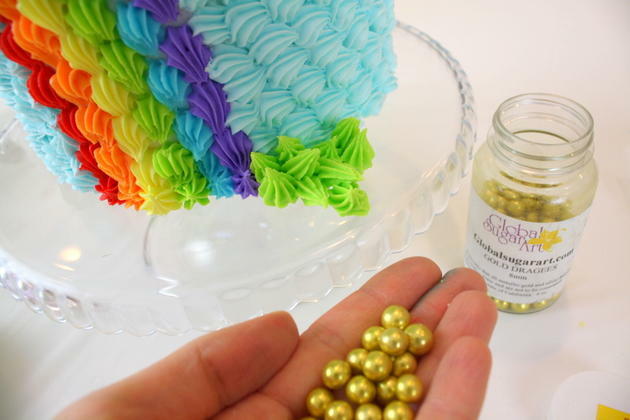 I used Americolor coloring gels to tint my frosting but go with whatever your favorite may be. 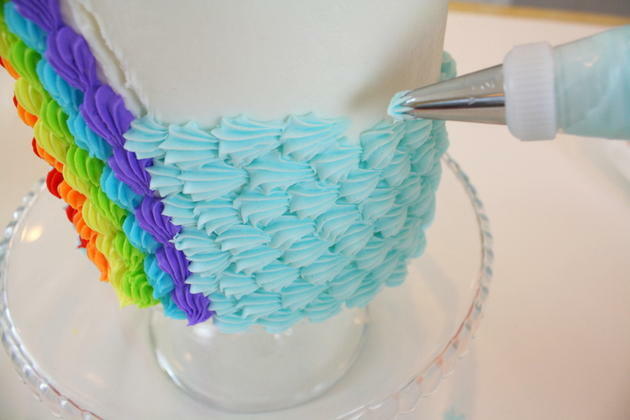 Okay, so here’s the part where I dive into the piping. 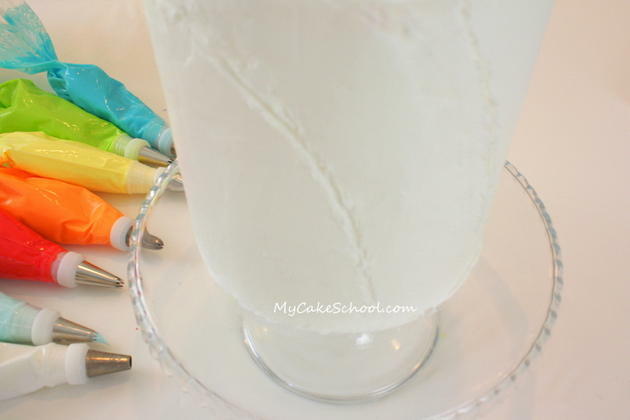 I’m using a Wilton 21 star tip (use whatever medium sized star tip you’d like). Here we are, three rows in! Yes, a little backwards, but still pretty! Our half rainbow is now complete! Now, I’m piping shells (still with the Tip 21) to fill in our sky. My blue is Americolor Sky Blue. You can see in the picture that I’m slightly staggering my shells, so that each row can be nestled into the row below it. It’s optional–if you pipe each row exactly as the row before it, you’ll have more openings to your crumb coat beneath. 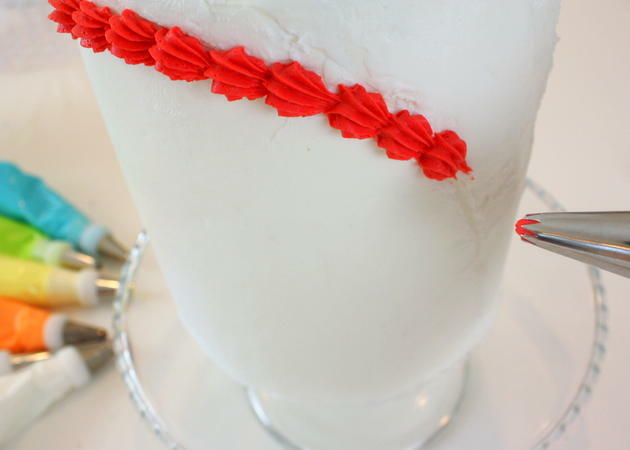 Have I mentioned that I love piping shells? Now…let’s have some clouds! Things are about to get very PUFFY! If you aren’t into puffy, then a nice smooth top, or a “shell top” would be great too. I’m armed with my Ateco 806 tip, which is a jumbo round tip. I also used my Wilton 12 tip, which is a medium round (and with enough pressure, is almost identical to the 806). Wahoo! Hooray for clouds ;0) — I tapped down all of those points once my icing had crusted a little. 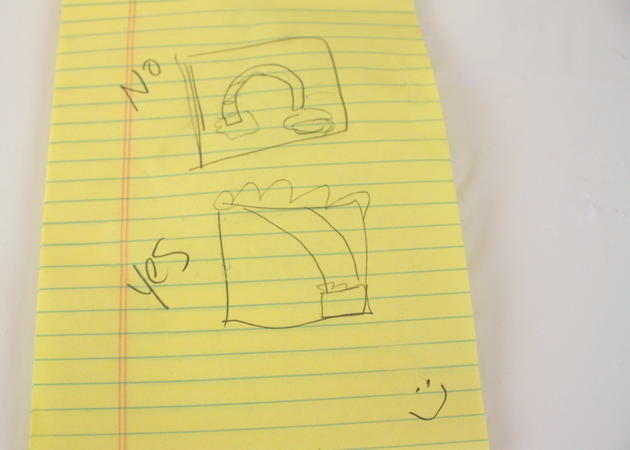 Also, I opted to throw out the pot of gold (which was in my sketch, did you notice?) — I didn’t want to bring in the color black. Plus, I figured that most people would be just as happy to find a pile of gold at the end of the rainbow. I know I would! 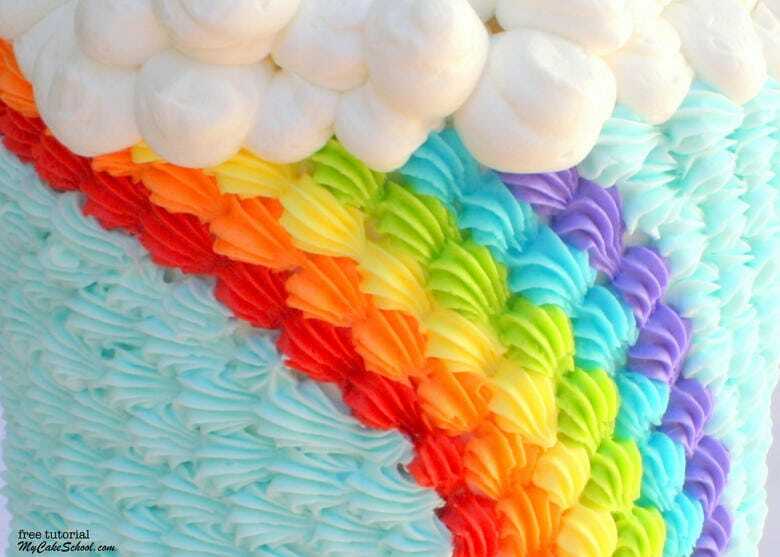 If you’re interested in even more cheerful rainbow cake fun, we have a roundup of the BEST rainbow cake recipes, tutorials, and inspiration! Follow the link to check it out! 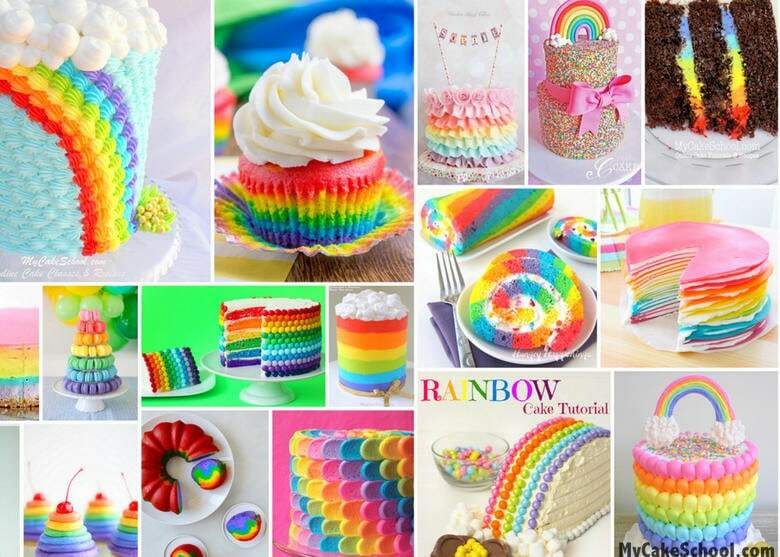 : Roundup of Rainbow Cakes! Thanks for stopping by! 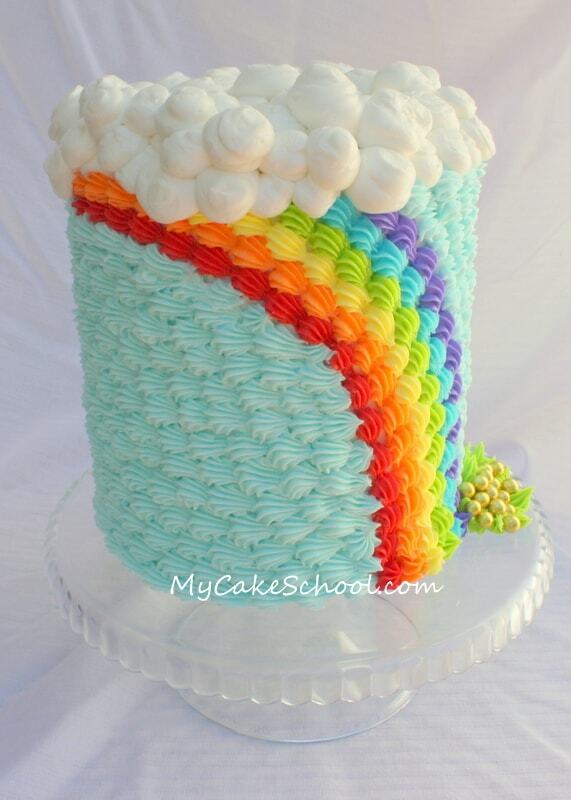 We hope that you enjoyed this rainbow cake cuteness! If you give it a try, make sure to leave a photo in the comments below. We would love to see your work! It looks perfect just the way it is. By the way, which way should it be, I can’t figure that out lol. Thanks Muazza!! 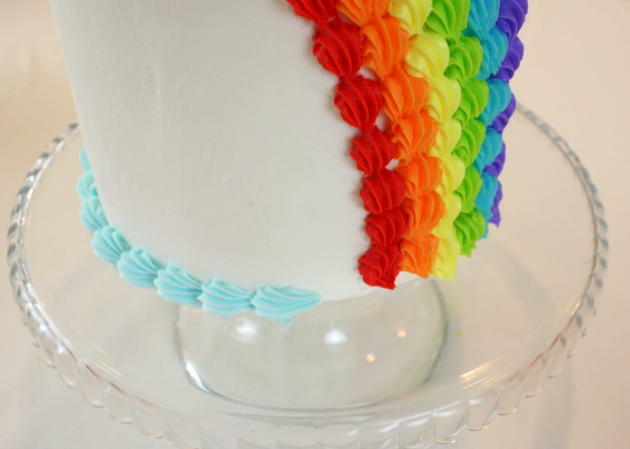 Usually moving from top to bottom, a rainbow would be red, orange, yellow, green, blue, violet–my rainbow is curving the wrong way for the color pattern that I did. Most people probably wouldn’t have noticed though ;0)! 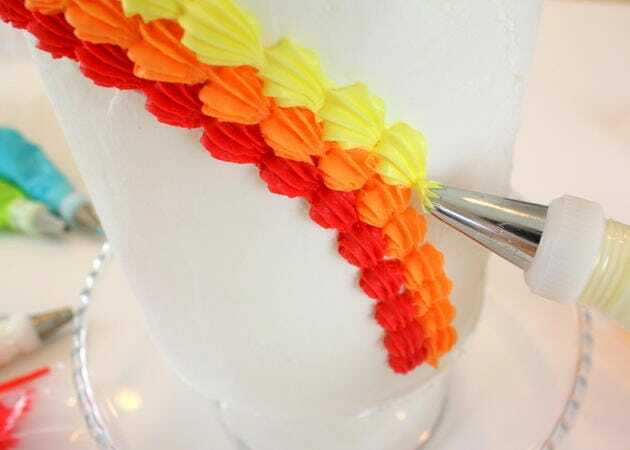 This is good practice for piping shells! 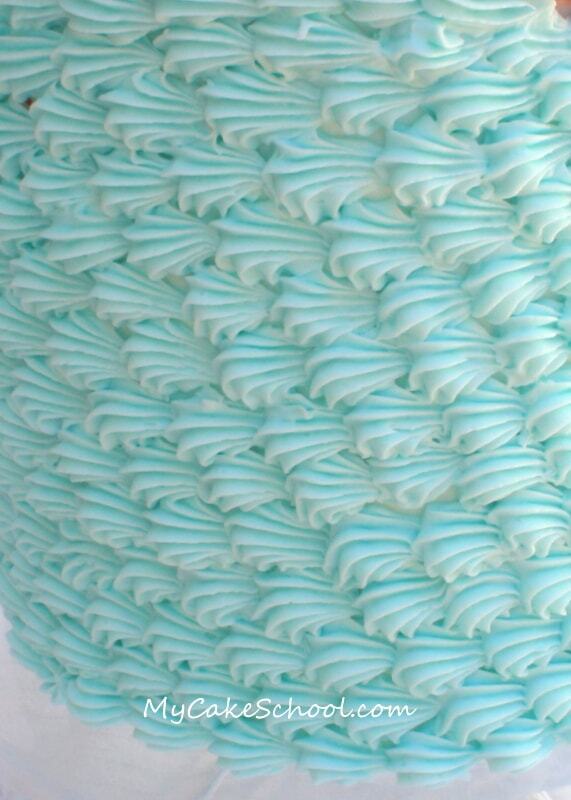 Hi Mellisa I want to ask you what is the frosting on the cake- Italian merengue cream or just whipping cream? Thank you! How do you get the red so red? I use Americolor super red and mine is never a true red. Hi Casie, We use Americolor super red also, we don’t do anything special. Ours is not a true red either, but red enough. Would you mind sharing the gel color used for the blue sky? Hi Jenny, Melissa used AmeriColor Sky Blue. If you need the other color names, she list them on the 6th comment under the last picture. Thanks Amy! Love that idea!